Today was an incredibly productive day! Our volunteer families did an excellent job of helping us with our units. They helped Linda and Jill with excavations in the back yard while Elena and Evan continued excavating inside the house under the floorboards. Elena and Evan discovered some pieces of torn newspapers with legible writing on them, a decorated shell button, and a small piece of textile (cloth). 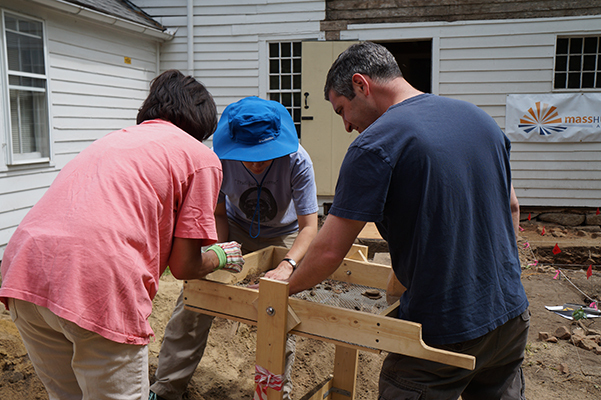 Linda, Jill, and the volunteers found some more bone fragments, window glass, and nails. In addition, they also found lots of gravel and roots! Jen and Eileen aided Mary in the lab cleaning and cataloging more of the artifacts that were found over the last few days. We would like to thank our wonderful volunteers once again for all their hard work! If anyone is interested in visiting the site, we are open for the next two Saturdays for our public days from 10 am until 2 pm. All are welcome and don’t forget to bring the kids! Many activities will be available for the little ones. 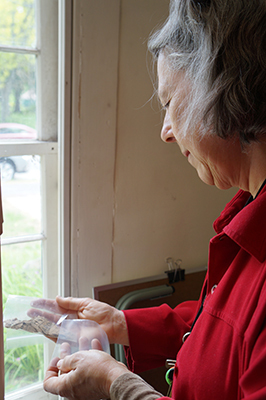 Nancy Rexford, Director of Historic Northampton, inspects some newspaper fragments excavated from inside the house. All excavated soil is passed through a screen to make sure all artifacts are recovered. Here, Linda and some volunteers screen soil from their unit.